Thirty-five years ago this month Sunnyboys released their eponymous debut. Containing the hit singles Happy Man and Alone With You plus live favourites I’m Shakin’, Trouble In My Brain, Tunnel Of Love and more Sunnyboys enraptured teenagers of the time (and generations to come) with an astute blend of hi-energy, pop hooks and brooding, longing wordplay. It was and still is a classic and has remained a constant in All Time Australian Album lists for its entire 35 year lifespan. But the 11 songs contained on the album were just a drop in the ocean from a well of creativity amassed by singer / guitarist Jeremy Oxley in 1981, as the demo sessions from January of the same year have shown us. The songs were quite literally dripping from Jeremy’s fingers. In celebration of the album milestone and the premiere period from when it sprang, Sunnyboys will take to the stage in February 2017 for a handful of shows playing a set entirely derived from 1981; a set that will also include Sunnyboys, the album, performed in its entirety. But wait, it gets better! For Sydney fans there will be the added bonus of seeing Sunnyboys 1981 gigging partners Flaming Hands – featuring singer Julie Mostyn and songwriter Jeff Sullivan – performing their stripped back blend of sixties style soul, R&B and psychedelia for first show since 1985! But that’s still not all … Also joining Sunnyboys & Flaming Hands on this momentous Sydney line-up will be legendary Sydney act Shy Impostors. Fronted by singer / songwriter Penny Ward and featuring the pre-Sunnyboys Peter Oxley and Richard Burgman alongside drummer Michael Charles, Shy Impostors existed for just nine months during 1979-1980 and releasing one (great) record only; the posthumous 7” At The Barrier in 1981. Its the first time Shy Impostors have played with Sunnyboys and the first time all three bands have performed together on the one bill. Elsewhere, and in a further series of firsts, Sunnyboys will be joined by the legendary X for their Melbourne show while a dynamic bill of The Celibate Rifles and Ed Kuepper with Mark Dawson will join Sunnyboys for their only Queensland appearance. 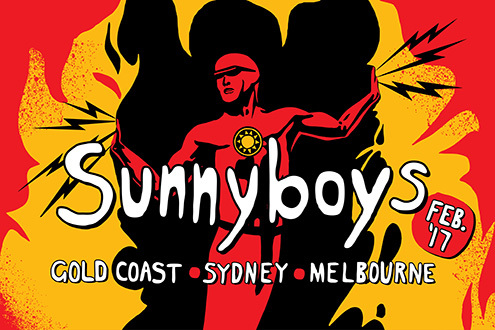 Don’t miss the feel good tour of this summer: Sunnyboys live! this February. Tickets for all shows on-sale Tuesday 27th September.